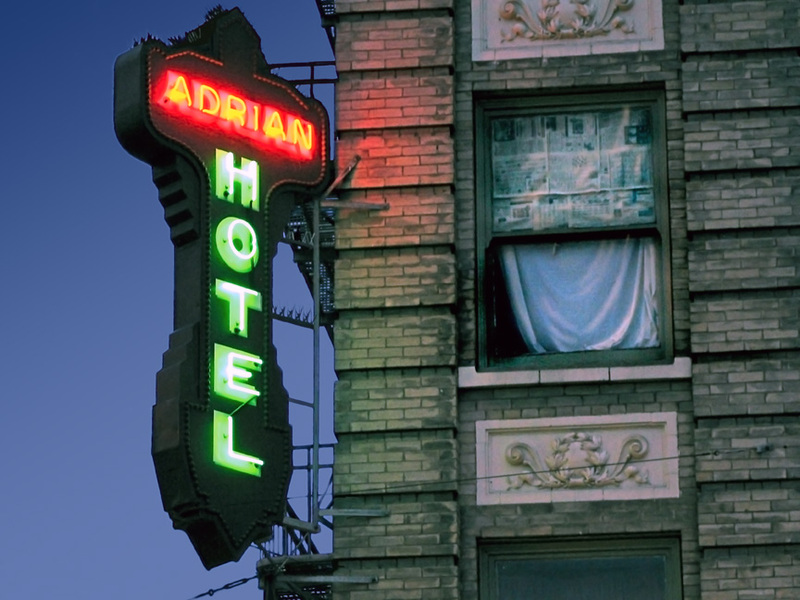 (337/15) 493–499 Eddy Street; Adrian Hotel. Stores and rooming house with sixty rooms and twenty-four baths. 5B stories; brick structure; arcaded top story, brick quoins, flat arches and decorative panels, galvanized iron cornice; three-part vertical composition; Renaissance/Baroque ornamentation; vestibule: arch order entry, tile floor; lobby; stair landing only; storefronts: corner store with display windows, tile bases, transoms; signs: cruciform neon blade sign at corner “Adrian Hotel”, round neon “Lafayette Coffee shop Prime Rib” sign; alterations: some storefronts, security gate; replaces three-story wood flats building of 1903 by same owner. Original owner: George Schaefer, owner of National Brewery, resident of Ross. Architects: Salfield and Kohlberg. 1907. 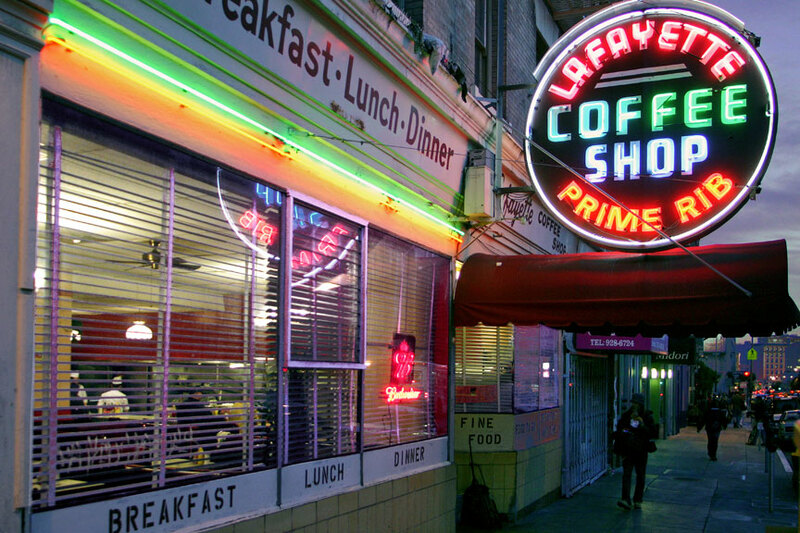 On the Hyde Street side of the Adrian Hotel is the locally renowned Lafayette Coffee Shop. I like this photo because it shows nothing more recent than the Coca-Cola sign, making it a real window to the past. Lafayette Coffee Shop. 250 Hyde Street. One of my earliest photographs, this image was captured one morning in 2003, just before dawn. I like it for its existential overtones: the angst of a pivotal moment in time. “Just Before Dawn”—sometimes my photos just name themselves.